This book presents evidence that infection is cyclical with the seasons, and that this phenomenon is mirrored in cycles of immune function. The book identifies the mechanisms by which immune systems are bolstered to counteract seasonally-recurrent stressors, such as extreme temperature reductions and food shortages. Stress, infectious diseases, autoimmune diseases, and human cancers are examined, and the role of hormones such as melatonin and glucocorticoids is considered. 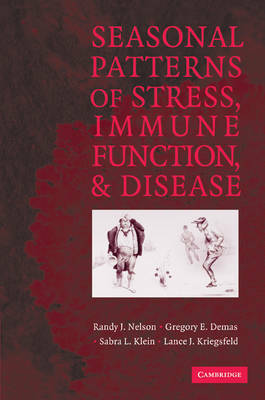 The book begins with an overview of seasonality, biological rhythms and photoperiodism, and basic immunology, and then discusses seasonal fluctuations in disease prevalence, immune function, and energetics and endocrinology as they relate to immune function. The clinical significance of this issue is also addressed, as such seasonal changes may play an important role in the development and treatment of infections. This first monograph to examine seasonal immune function from an interdisciplinary perspective will serve practitioners as well as advanced undergraduates and graduate students in biology, immunology, human and veterinary medicine, neuroscience, endocrinology, and zoology.